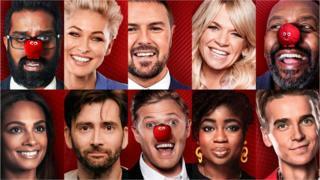 Some of Britain’s best-loved TV and film stars will come together in aid of Comic Relief on BBC television later. The last Comic Relief in 2017 raised more than £71.3m by the end of the night to help vulnerable people in the UK and around the world. This year, a star-studded line-up will entertain viewers on BBC One from 19:00 GMT and encourage them to donate. It then switches to BBC Two during the Ten O’Clock News, returning to BBC One from 22:35 GMT to 00:30 GMT. Hosts will include Lenny Henry, David Tennant, Zoe Ball, Emma Willis, Romesh Ranganathan, Paddy McGuinness and Alesha Dixon. Louis Tomlinson has pulled out his planned performance following his sister’s death. Here are some of the highlights viewers can expect this evening. Image caption What will have become of the characters a quarter of a century on? 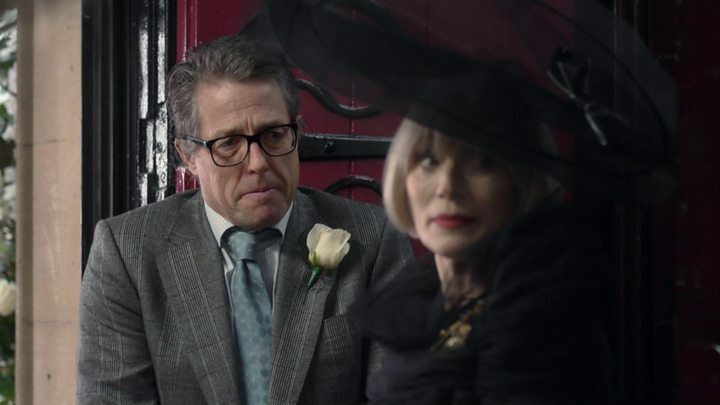 The evening will also feature the heavily trailed and highly anticipated One Red Nose Day and a Wedding – Richard Curtis’s sequel to his smash hit Four Weddings and a Funeral. He didn’t do the greatest job of looking after the home secretary in BBC One’s smash hit thriller, but Bodyguard’s David Budd (Richard Madden) will be back in action for Comic Relief. This time his mission is to protect the Red Nose. If you missed Lord Sugar putting 10 celebrities through their paces for Celebrity Apprentice For Comic Relief, you can watch it now on the BBC iPlayer. Ten years since the first Red Nose Day climb of Kilimanjaro, a new batch of famous faces, including Strictly judge Shirley Ballas and BBC Breakfast’s Dan Walker, trained to walk up Africa’s highest mountain. A show about their climb – Kilimanjaro: The Bigger Red Nose Climb – was broadcast on Wednesday and you can watch it here. Strictly Come Dancing hosts Tess Daly and Claudia Winkleman took on a gruelling danceathon challenge in the run-up to Red Nose Day, with coverage streamed live on the red button.